Auto Express’ 5 star Best Buy speed camera locator 2016 and ‘Best speed camera detector to buy in 2017′ by Carbuyer UK. The Cheetah C550 is designed from the ground up to keep getting smarter with time. It’s the very latest and most advanced of Cheetah’s innovative and award winning GPS speed and red light camera detectors. The C550, utilizing our internationally acclaimed Trinity 3.0 database to the maximum, sets the highest benchmark for consumer GPS speed and red light camera detectors. Awarded 5 stars and Best Buy by Auto Express in their 2016 speed camera locator test and ‘Best speed camera detector to buy in 2017′ by Carbuyer UK. The Cheetah C550 is our newest and most advanced GPS speed and red light camera detector. It’s the latest in a long line of hugely popular and award winning Cheetah GPS detectors in use around the world and is designed to fully maximise the potential of our Trinity 3.0 database. You are in complete control over which type of alerts to hear and how they sound. One complete alert sequence comprises an initial heads-up chime, up to four informative spoken voice descriptions for each location, an overspeed alert tone (if travelling above the stored speed limit for that alert) and a final camera pass chime. Alert chimes can be switched on or off to match your preference. Overspeed alert tones can be individually tailored in multiple ways for each different type of alert type to meet your driving style. The C550’s impressive, bright and easy to read LED display clearly shows all the vital driving and alert information a driver needs. The yellow digital speedo remains visible at all times, especially in bright sunlight, and the handy clock and compass features keep you nicely informed. During an alert, the current speed flashes to highlight if you are over the speed limit and the clock switches to show a numeric distance countdown to the alert site. There is also an additional distance countdown progress bar to emphasise the alert site proximity or to keep you updated during Average Speed camera systems and Mobile enforcement zones. 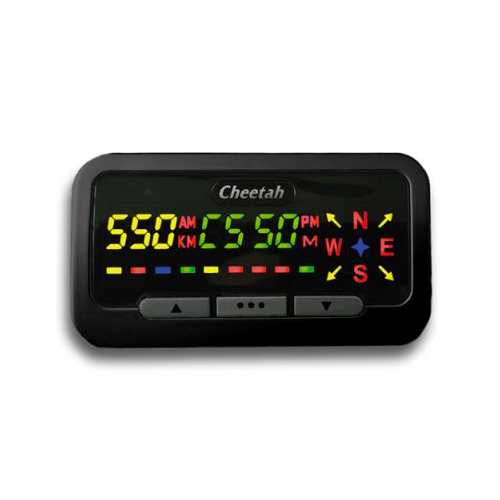 The Cheetah C550 speed and red light camera detector is packed with hardware features, including connections for an external GPS antenna, car stereo mute facility, headphone socket and two separate mounting options (dash and windshield). There’s also an optional hard wire kit to allow a more professional installation in your vehicle. Cheetah undertakes a programme of continuous alert enhancement, always looking to improve our multi-point false alert filtering technology and our “effective distance” false alert filtering for each camera location. Additionally, our intelligent multi-directional alert ability is enhanced by an ever increasing number of new alert descriptions to maximise the benefits of our unique Trinity 3.0 database. The Cheetah C550 is designed from the ground up to keep getting smarter with time. Individually configurable audio for each different type of alert to suit your preferences. Custom alert distances* – select different warning distances for different types of camera. Dark mode – for stealth installations, or for night time driving, the display will only light up during an alert. Alert mute – quickly switch off / on the audio for the current alert. Alert cancel – quickly cancel the current alert if required. Whisper mode – keeps the C550 quiet if you are under known speed limits. Adjustable alert speed limit tolerance – increase the overspeed alert activation speed to suit your driving style. Variable warning distance – automatically reduces the alert distance at slower speeds. Personal speed limit – will play a tone each time you exceed your preset speed. Personal locations – store up to 64 of your own locations. Power up via PC to allow adjustment of settings. ** School zones is a new feature currently in Beta testing. School zone warnings are not available for all regions. 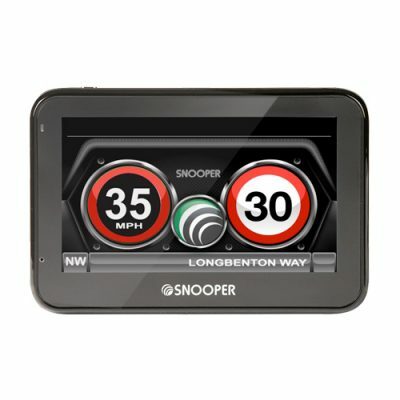 Highway cameras** School zones is a new feature currently in Beta testing. School zone warnings are not available for all regions. Some vehicles may require this such as Audi Q7, Range Rover models and some ford models, please call us if your unsure. If you purchased your C550 and Membership with the unit you will automatically be registered for warranty and database updates. If you purchased your C550 from an authorised dealer, you can register on SpeedCheetah.com and complete serial number and purchase details after you log in. To update your C550, simply log in to the Member’s area, connect your C550 to your Windows computer using the supplied USB cable, then click on the required database region. If the update does not begin automatically, please click on the downloaded file to run. Follow the on-screen prompts to update your C550. The C550 is fully legal in all the countries where we promote, including the UK, USA, Australia and most of Europe. The C550 uses the same technology as traditional satellite navigation products. 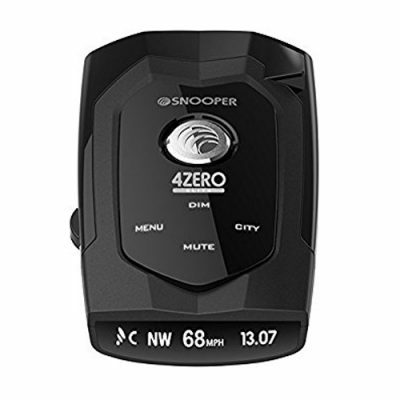 It’s not a radar detector, it’s a superior GPS only device that can give you alerts to many cameras that a radar detector can’t. Some countries restrict the use of any type of device (including GPS only devices) that lets you know where speed cameras are. These include Satellite Navigation units, GPS speed camera locators, smartphone apps, radar detectors and laser jammers.